Like the blog. Just to note though, you appear to misunderstand what regression to the mean is. Its a phenomenon that occurs when you select based on high levels of depression. Even if nothing changes with their condition, their next score will probably be closer to the mean that the first. Hi disgruntled; thanks for the comment. I’m not sure where you think the misunderstanding lies, though. What I said is that people tend to seek treatment for depression when they’re feeling particularly low; it therefore stands to reason that many people will get better irrespective of treatment simply because they’re regressing to the(ir own) mean. That seems to me to be exactly what you’re saying, no? 2. The effect arises in real world settings–such as exams, debate tournaments, and gun owners preparing for hunting season. That is, Burson et al. could modify the effect by introducing extreme conditions, but if we look at the types of tasks people face in their daily lives, the usual self-misestimates appear, with poor performers very much missing the mark. 3. The DK effect obtains even if respondents are promised up to $100 for accurate assessments. The blog author is correct in describing what the original effect is–poor performers are overly confident relative to their actual performance. They are not more confident than high performers. Couldn’t there also be an effect from the greater knowledge of the higher scorers and the universe they use for comparison? For instance, a chess whiz would be more likely to know accurately how his skills rated compared to those of Bobby Fischer than a man with normal chess skills would. If you are always comparing yourself to the very best, your self-assessment is always going to be more accurate with relation to them, but perhaps not so accurate with regard to the common run of men. 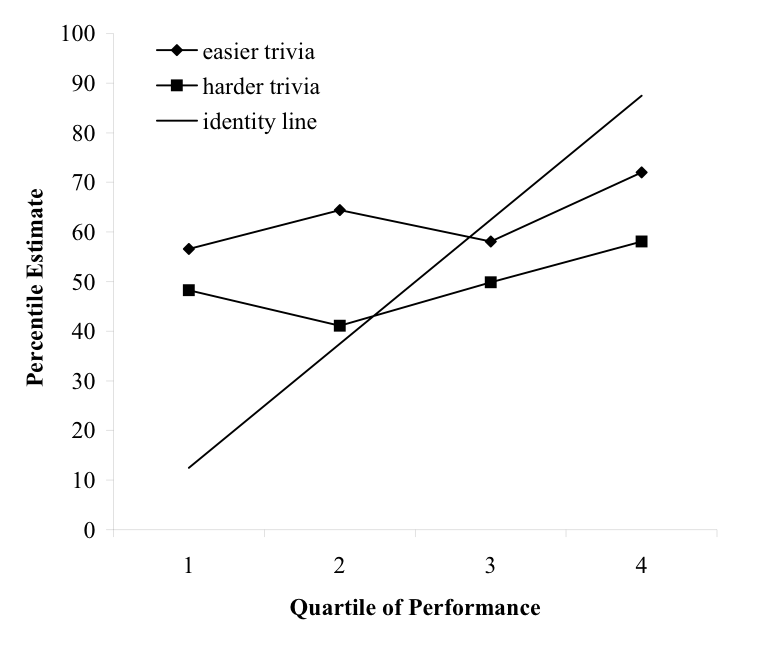 Tasks that an expert considers easy might be more likely to be put into the “Oh, everyone can do THAT!” category by the expert than by the 99.5% of others who don’t have the first idea how to approach such a task. You still misunderstand regression to the mean. It’s a purely statistical phenomenon and has nothing to do with “natural history” or depressed people getting better or any actual change in the construct you’re trying to measure. To work with your depression example: any time you try to measure depression, a person’s score will be made up of their actual depression and some error due to individual differences and randomness. If you measure the person again the very same day, the score will be different due to change in randomness and individual difference. So there will be some people whose first scores are outliers and seem to have exceptionally bad or exceptionally good mood, but don’t really. If you take the first scores and use them to select a sample of highly-depressed people for a study, you will scoop up all those low outliers. Their second scores will be much closer to the population mean and it’ll look like an improvement, but their mood HASN’T CHANGED. What this hopefully makes clear is that regression to the mean is a phenomenon in repeated-measures experimental designs. That is, one where you take before-and-after measurements of your participants and compare them. If you’re only measured each thing once, as here, there can be no regression. I haven’t read the papers you cite so I don’t know how they make the case for regression to the mean, but your blog doesn’t make it. Same thing the first poster said, but longer, hope it helps. The assumption in the Ehrlinger paper is that regression to the mean results from unreliability, in which case correcting for attenuation would provide better estimates of the “true” effect. But regression to the mean doesn’t just reflect reliability (or lack thereof); it can in fact (and generally will) take place in the presence of perfectly reliable measures. Take an extreme example: if all of the variance in people’s perceptions of their own performance reflected a single stable trait of self-perception (i.e., how good you think you generally are), self-perceptions would show extremely high test-retest and internal consistency reliability. Yet you would still get strong regression to the mean effects if you selected participants based on actual performance levels. The reason is simply that unless two variables are perfectly correlated, individuals who are extreme on one variable will generally not be extreme on the other. Again, this would be true even in the presence of two perfectly reliable variables. So I don’t think that the Ehrlinger analyses really demonstrate that regression to the mean isn’t a problem here. With respect to the point about Study 3 in Kruger and Dunning, I have no trouble believing that result. As I noted in my post, I’m not suggesting that miscalibration between perception and actual performance is never due to metacognitive limitations; given your work and that of other people, I think that’s very plausible. The question is just how much of the variance under a range of circumstances reflects metacognitive limitations versus other more general explanations like regression to the mean, and in that sense, I find the evidence compelling that the latter account for the bulk of the effect. I think it’s very hard to determine which tasks are natural and which aren’t; it seems to me that the real world contains lots of instances of both the types of tasks you used in your studies, and the ones that Burson et al used. I don’t believe that, for instance, giving university undergraduates a multiple-choice trivia quiz on which the mean accuracy rate is 50% is ‘extreme’; situations like the ones Burson et al designed certainly do arise frequently in the real world! I’m willing to believe that there may be more situations in which people tend to do relatively well than in which they do very poorly, on average. But of course, even if that’s true, it still doesn’t mean the correct explanation for the resulting discrepancies between actual and perceived performance is metacognitive; Burson et al could be right about the source of the discrepancy but wrong about the distribution of difficulty levels in ordinary life (which I don’t think they make a statement about in any case). I agree that this is a striking effect, but I don’t think it contradicts any of the alternative explanations I discussed. For instance, if (per Burson et al) a major source of information people use in determining their relative standing is their own subjective difficulty in performing a task, there’s no reason to think that paying subjects for performance is going to make them any more accurate. If I have little information to rely on other than how hard I found a task, why would offering me $100 make me do better? So again, I don’t see this as a problem for the accounts I’ve discussed. Thanks for the comment. But what I’m talking about is a purely statistical phenomenon. I’m saying that people’s levels of depression over time are stochastic; for any number of reasons, a person could be more depressed at time A than at time B. If you select your group of depressed people based on their scores at time A, they’re going to, on average, have more moderate scores at time B. Whether that reflects measurement unreliability or “true” change in mood is immaterial; from a measurement standpoint, it’s a purely statistical phenomenon. And I don’t think it’s fair to characterize regression to the mean as only a problem for repeated measures. My sense is that it’s discussed more often in the context of relationships between different variables (for instance, here’s a nice paper providing several examples). If you select a group on the basis of variable A, and then measure variables B, C, and D, the means on those other variables will generally be less extreme. That’s a necessary feature of precisely the same statistical phenomenon, and will happen (on average) any time the correlation coefficient between two variables is less than one. Interesting. One example of DK that comes to mind is driving ability: it seems to me that poor and mediocre drivers perceive themselves as much more competent than they actually are. My guess is that, like the children of Lake Wobegone, nearly every driver rates himself as above average. It also seems to me that the current denizen of the White House perceives his performance (“a solid B+”) as somewhat higher than actual results would suggest. Thanks for the comment. This sounds similar to a point Krajc and Ormann made recently. They pointed out that the inferential problem faced by people at the low end of the samples Dunning, Kruger et al used may be more difficult than the problem faced by those at the high end. The issue being that Cornell undergraduates tend to be drawn from the positive end of the distribution, and probably would have had limited prior experience being amongst other people of their own ability. In other words, if you’re used to be being at the upper end of the distribution relative to the general population, and then you’re dropped into another pool of much higher-performing people, it shouldn’t be surprising if it looks like you’re miscalibrated. Whereas people at the high end of the sample don’t have that problem, because if they perform well relative to a highly selective sample, they obviously would also perform well relative to a more general sample. Thanks for the link, I see your point now and I’ve learned something about regression to the mean. I do think that your last reply viz measurements as stochastic variables changing for any number of immaterial reasons is basically the position of the first commenter and me, but quite different from the position in your blog post where you devote a whole par to explaining regression to the mean for depression in terms of natural history. It’s the attempt to identify the immaterial and unidentifiable that caught our attention. And both the examples you give in the post are repeated measures. Clearly you understand the phenomenon better than I do, but it doesn’t come through in your post for those reasons. That’s fair; you’re right, I was a bit careless in my example. I wasn’t really making any deep point about depression per se, but simply pointing out that changes in behavior that often get interpreted substantively by researchers may not reflect anything important about the course of depression itself, but are simply a statistical artifact. But I concede that this is viewpoint dependent to some extent; if you’re someone who studies clinical depression (which I’m not), you might well want to separately consider veridical changes in people’s mood from regression to the mean induced by measurement error. > 1. That statistical regression to the mean accounted for only a smidgen of the DK effect. The top quartile from the 1999 paper, at least, looks dominated by “regression to the mean” to the point where it even overcomes the effect of positive illusions. Much more than what I would call a smidgen, at least for the 1999 paper! Or is there a better alternative explanation? The DK effect obtains even if respondents are promised up to $100 for accurate assessments. 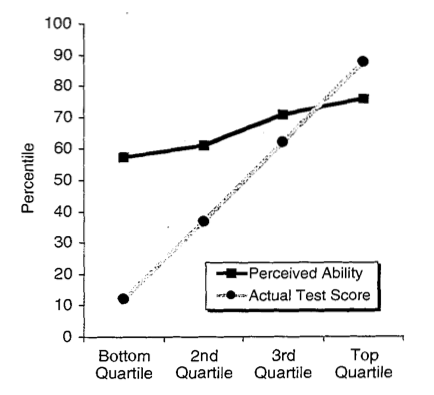 The question is whether that assessment task demand more than trivial cognitive ability. In that case, monetary rewards will do no good, as discussed in this research presentation. Do you think that this effect is relevant for older adult perceptions of memory deficits. The worse performers feel that they are OK versus those with memory function that is actually above average, worry more deeply about performance issues? Thanks for the post, and the great commentaries. I’m immediately reminded of the recently reported fact that American students have the lowest math scores in all areas except confidence where they outscore all other nations. In this case, I’m afraid, the least competent seems to have the highest assessment of themselves. I take this as very bad news. I’m a big fan of Russell’s, David, but in this case that’s actually not what the data show. The Dunning-Kruger effect is that incompetent people are wildly overconfident whereas competent folks are much better calibrated. But, Russell’s comment notwithstanding, the competent people still think they’re better than the incompetent people do. And in fact, there’s some of the other evidence I mentioned above showing that when the task is very difficult, you can get the effect to flip entirely (i.e., so that less competent people are now more accurate when judging their own incompetence). The subjective ‘how did I do?’ feeling is absolute, but being plotted against a relative measure. Even if you’re exactly 50% percentile, scoring 8/10 feels better than scoring 4/10. Based on the above graph, I would conclude that the subjective measure is pretty accurate in an absolute sense. This is consistent with the second graph. As a bonus, if that kink at the bottom end isn’t an artifact, it’s also still consistent with DK effect. Pingback: Read This Post In A Funny Accent | Quis Custodiet Media? I found a solution to this play in the mind. I realised this character I was assuming I was was actually a result of outside influences. I had a dig in my past. It seems school left a neediness for a false me to be created to take the brunt of the world. Like a early brain development reflex. I observed what was arising in me for desire and thought without reacting to it for a while. Cut myself off from outside influences and media. Especially entertainment and news. 1. All the colors that were used in the painting. 2. The type and design of the brushes used. 3. The origin of the frame, the age of the frame. 4. The origin of the canvass, the age of the canvass. What does he know about the painter after years of study? Now, imagine a scientist studying the universe. Into which category will he fall? Thank you!, John, for supporting my argument, and yes, you are correct, he will (only) know how to spell the names of all the articles, tools, implements he used during his life. Once again, John, thank you for canvassing on my behalf. I used to be modest. Then, I had people take advantage of me enough times. I had a 1440 SAT. One boss mistook my modesty for incompetance. I’m like, “Dude! I have a 1440 SAT. I’m just modest.” If you are humble and correct people for not comprehending the vastness of your intelligence. You can big a bigger person and let the pathetic person think you are stupid, but ouch. Oh hell no, not when it has consequences. You gotta get in their face and never be modest or they’ll mistake you for a loser. Pingback: The 19*** point* Student/Amateur/Untrained Genius Design Process | apophenia inc. Very interesting post. Another way it seems to be misinterpreted is that it shows unintelligent people don’t know they are unintelligent/over-estimate their own intelligence (again because they don’t possess the mental tools to realise their lack of knowledge). But this study looked at competence rather than IQ (whilst you could make the argument logic is linked to IQ, I doubt many would argue they are synonymous). Do you think IQ tests could be used in the same way to judge and compare intelligence (as they did with competence in the original study)? Are there any studies that look at IQ in this way?